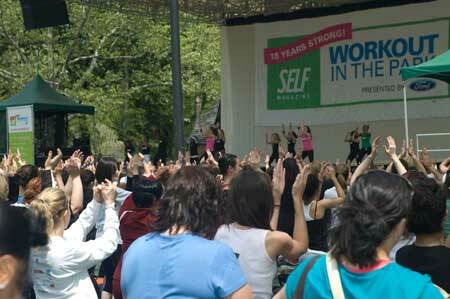 Jillian Michaels made an appearance today at the 15th annual Self Magazine Workout in the Park at Central Park. The event consisted of multiple workout sessions, sponsor booths and autographs/Q&A with Jillian. See below for video and photos of the event. See below for Jillian Michaels being introduced at the event and a few more photos. Make sure to view the dietsinreview.com youtube channel for more footage as well as our flickr account for lots of photos of the event. Jillian Michaels – Self Magazine Workout in the Park from Diets in Review on Vimeo. Whether you find your incentive to get in shape from Biggest Loser or any other place, if you’ve gotten to the point where you want to make a change in your mind/body/soul More Power To You! I’m all behind Jillian Michaels for the difference she has made in many lives…but too many put her up on a pedestal. And as for her sidekick Badalamenti….well, goes to show that you can’t judge a book by it’s cover! Back to getting in shape….we heal from the inside out! ‘Best to all who read this, I hope you all can find the real you, obtain your goals, but most of all live a purposeful life!